Monterey and Carmel are two cute, waterfront towns south of San Francisco. Both offer shopping, attractions and several other things to do. Both are about an hour and a half to two hour drive from San Francisco. If you are like me and enjoy watching the scenery, then I recommend looking into a guided tour. I recently had the chance to go on the most popular day tour to Monterey and Carmel. Your day starts with an 8am pick up near Pier 39. I recommend grabbing a seat at a window on the right side of the bus (as you face forward - opposite side as the driver). 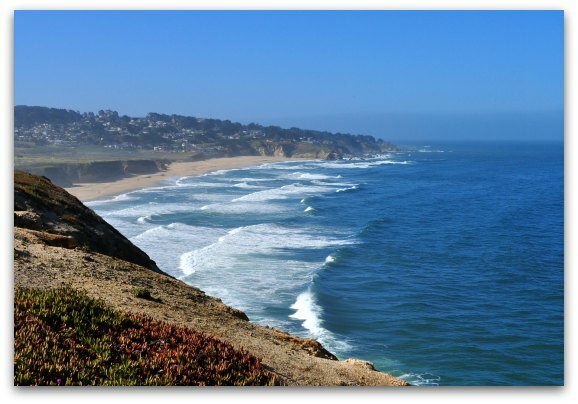 This side offers gorgeous views of the Pacific Ocean as you drive down Hwy 1 to your destination. The first 20 minutes of the trip take you through San Francisco and down Hwy 101. This part of the trip isn't very exciting, but your guide offers some interesting facts about the area. From here, you will reach Hwy 1. This highway offers a slower, yet scenic route down to Monterey and Carmel. Your first stop is around 10am. At this point, you will take a 20-minute stop at a small store on Hwy 1. There isn't much to see here, but it's a great place to stretch your legs and grab something quick to eat or drink. Insider's Tip: Due to the distance of this tour, most buses have an onboard restroom. If you don't see the restroom, confirm its location with your driver before you leave SF. After your rest stop, you will continue to make your way south on Hwy 1. You will drive through the small down of Santa Cruz and make a quick photo stop shortly after. This is just one of the pictures I took during this photo stop. You will reach Monterey around noon. The bus stops a block away of the famed Cannery Row district. You will have two hours on your own to grab lunch, go shopping or visit some of Monterey's attractions. 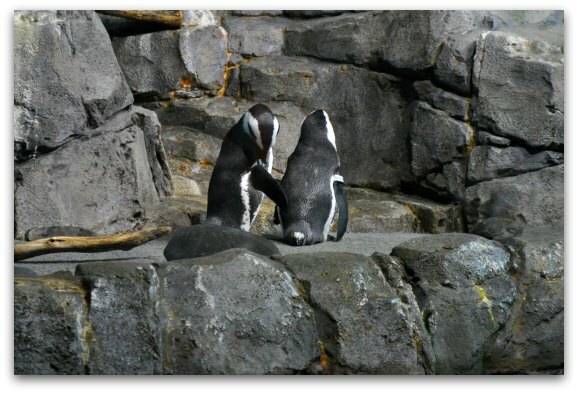 Monterey Bay Aquarium: This world-renowned aquarium sits on the northern end of Cannery Row. If you know you want to visit this aquarium, I recommend purchasing your tickets online before you arrive. The ticket line here can get long and you don't want to waste time waiting in line for tickets. Cannery Row Attractions: This page provides a list of everything there is to see and do on Cannery Row. Here you will also find some restaurant recommendations and list of the most popular places to shop. After the stop in Monterey, you will then continue south along the famous 17-Mile Drive. This gorgeous ride takes you along the waterfront through Pacific Grove. You will then enter Pebble Beach. 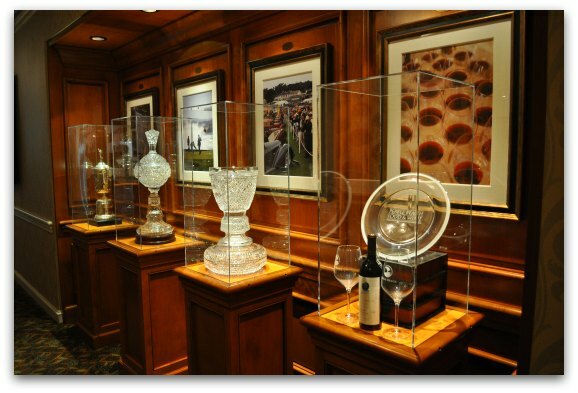 This stunning gated community houses one of the most famous golf courses in the world. During your ride, you will see glimpses of the greens of this luscious golf course as well as the multi-million dollar mansions that surround it. 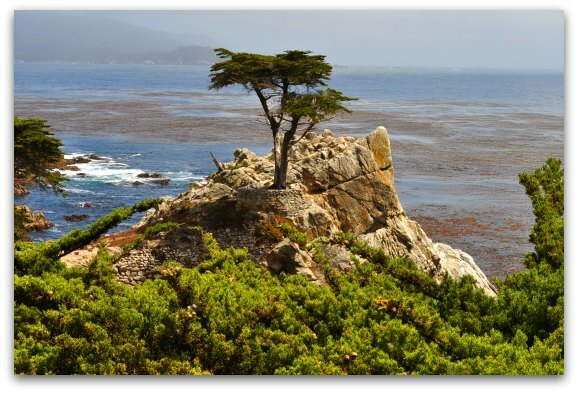 Pebble Beach is also where you will find the Lone Cypress. This single tree sits on a rock island that is not sheltered from the rain and winds along the coast. It's estimated to be more than 250 years old. You will stop here to take photos and admire this lone tree for about 20 minutes. 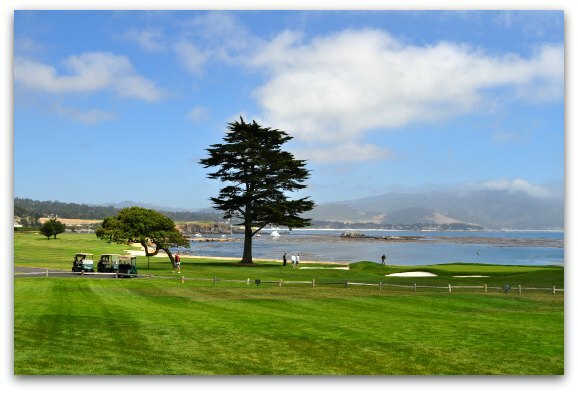 After another 15 to 20 minutes on the bus, you will make another stop at the Lodge at Pebble Beach. Here you will have about 25 minutes to look around. You can also grab some coffee, a drink or do a little shopping for new golfing gear. I recommend heading through the hotel lobby to the back patio. It's open to the public and you get some amazing views of the golf course and waterfront. While you are in the main lobby, make sure you head toward the bathrooms to take a closer look at these beauties. These are four of the eight trophies on display in the hallway. After your self-guided tour, you will hop back on the bus and continue south along the 17-Mile Drive to Carmel-By-The-Sea. This small seaside town also offers shopping, restaurants and a few attractions. Since it's smaller than Monterey, you will have an hour of free time here. At this point in the day, many of us were done shopping, so we walked a mile downhill to the beach. The walk down wasn't bad, but it took about 20 minutes to hike back up the hill. I recommend this to those looking to stretch their legs during this last stop or those wanting to spend a little more time along the water. After you are done shopping and enjoying the quaint village of Carmel-By-The-Sea, you will return to the bus for the journey back to San Francisco. The return trip takes only about two hours, since you will head back up via the freeway. There are no stops along the way, so make sure you grab something to eat or drink in Carmel for the ride home. You will get to SF around 7:30pm or 8pm. As you approach the city, the bus driver will confirm your drop off location. You can also get off the bus at a pre-determined stop in Union Square or Fisherman's Wharf. The Monterey and Carmel day tour is one of the most popular trips during the busy season. I highly recommend that you book your seat in advance, so you don't miss out on this journey. You can book them online through Viator, which is where I book most of my tours. You can also check Goldstar (an online ticket discount retailer) to see if they have any half-priced tickets on sale for this tour. I have no doubt you will enjoy your journey!